Hotel Registration is now available - click here! The spectacular city of Las Vegas awaits you. As the entertainment capital of the world, there are over 100 live shows and entertainment venues to see daily. Las Vegas also touts world-class cuisine with an array of restaurants by world famous chefs. 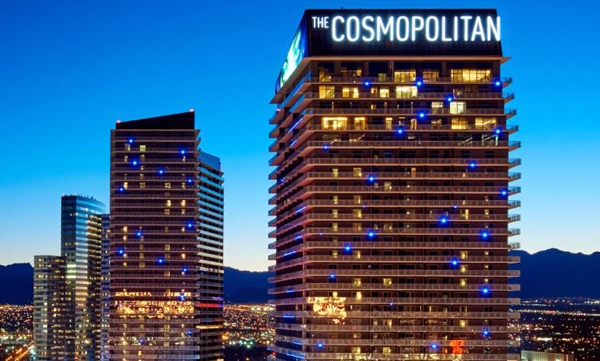 One of the newest attractions in Las Vegas is the Cosmopolitan hotel itself. Located directly adjacent to the world-renowned Bellagio and its famed fountain show, the Cosmopolitan is one of the newest hotels in Vegas. The hotel itself is a $4 billion stunning architectural statement with a chandelier bar that spans two stories. The 2,995-room resort, opened in 2010, features oversized, private terraces accessed via large, sliding glass doors. Bright, spacious interiors provide kitchenettes, multiple flat-screen TVs, and luxurious bathrooms. The Cosmopolitan also has some of the country’s top chefs, three distinctive pools, 44,000 square feet of salon, spa, and fitness areas, and a 100,000-square-foot casino. Diverse culinary offerings led by world-renowned chefs range from Italian and French to Asian and Mexican cuisines. Set in the center of the Strip, this unique resort provides an enchanting destination amid the attractions of Las Vegas. The Cosmopolitan of Las Vegas is less than 5 miles from McCarran International Airport. Should you want to put aside Vegas’ bright lights and casinos, visit many of the natural wonders that surround this city. Over five major parks and wonders are in close proximity. From Red Rock Canyon to Death Valley or Hoover Dam to Grand Canyon National Park, there is so much to do and see.